He is sweet. He looks cute. But parents beware — he is overindulgence. He is running around us everywhere, urging us to buy more, give more, and do more for our children. We can get caught up in his game unintentionally. The presence of the Gingerbread Man is the New Normal. 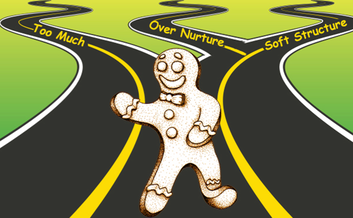 Join the Gingerbread Man- the symbol of overindulgence, as he shows us all the ways we are invited, and sometimes pushed, to overindulge our children. 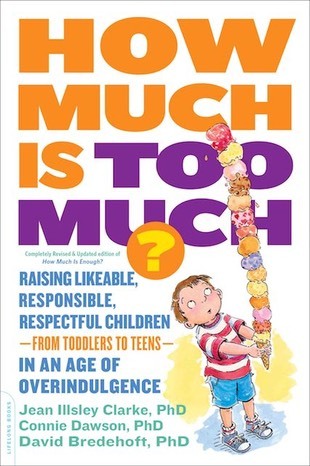 To help us think about overindulgence and what to do instead, we look at two types of families in this course. Parents in the Good Heart families have big hearts. They want their children to be happy and to have the good things in life. Their intentions are good, but they overindulge their children. In other words, they get caught up in the Gingerbread Man’s game. The foundation of a healthy family is a good heart, but it is not enough. Parents in the Strong Heart families wrap their good hearts in the strengths it takes to resist the influences of the Gingerbread Man. They add enough strength to create loving, in-charge parenting. They teach their children how to be accountable, and responsible for themselves and toward others. Both sets of families have to deal with the many pressures to overindulge. Both have been invited, and sometimes pushed, by the Gingerbread Man. Most of us are Good Hearts sometimes and the Strong Hearts at other times. This course will help us stay on the good and strong path. With the tools and strategies in this course, you can build your own version of a Strong Heart Parent, and explore some of the reasons people may be tempted to overindulge those around them. Family values, what are they? Has overindulgence become the New Normal? Identify the three ways of overindulging and what to do instead. Flip the negatives of overindulgence into positives. Use the Test of Four to decide if something is overindulgence. Use the Developmental Parenting Highway to stay on the road to success. Each of these modules is introduced like a piece of a jigsaw puzzle. Completed, the puzzle becomes a picture, a pictogram, of what you want for your family — Your Own Family. Professionals working with parents, guardians, or those working with children can use this course in a variety of ways. Online Course: The course can be taken on their own time at their convenience. Take and Teach: Each module and its activities can be easily adapted for classroom use. Hybrid Course: The course can be assigned and used to spark in person discussion. Video Resource: Professionals can link the short course YouTube videos on their own social media sites, webpage, or email listserv to provide a quick resource for parents as a research based tool for common parenting questions. NOTE: The Overindulgence Project in association with The University of Minnesota Extension is working together to develop this free online course. It will be available soon. Lisa Krause MA., Certified Family Life Educator, parent coach and adjunct professor at Concordia University. Lisa is passionate about helping professionals and parents grow strong and healthy families. Click here to learn more about Lisa and Parent Coaching.